Botanical, terrarium jewelry is a growing trend--literally. 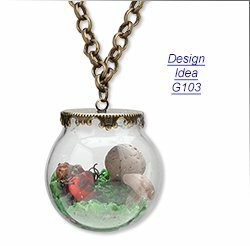 These eco-inspired jewelry designs are wearable, living curiosities made with vessels and specific types of plants or moss. Often, air plants are utilized for non-enclosed designs since they don't require direct sunlight. All you need is to spritz the plant or run it under water twice a week. 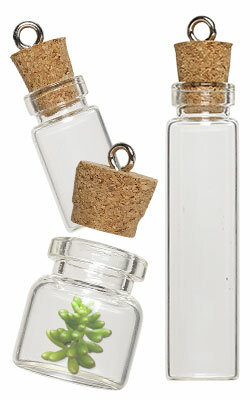 For enclosed terrariums, the vessel needs to be put in moderate sunlight long enough to create condensation inside. Some designs have the moss and plants glued down with a hot glue gun or E-6000® while others are on a bed of sand and then the plant matter is stuffed in to fill the rest of the space. There are some plants, such as succulents, that will eventually wilt. Corked bottles (or glass ornaments) that can be opened again are best for these creations. After the plant has died, simply open up, pull out the plant and put in a new one. Of course, corked bottles can also be glued shut for extra security when using moss and other plants that recycle moisture through sunlight. Also available are Keepsafe Keepers™ in pendant or ring components. Since these are sealed after creation, moss or other low-maintenance plants able to live off of recycled condensation are the best choices. These vintage-inspired findings are also great for use as holiday snow globes with glitter or micro bead snow. Another trendy way to wear your air plant jewelry is with wire wrapping. The plant is wrapped just 2-3 times with thick-gauge lightweight wire, such as round aluminum wire, in a loose conical shape. The plant fits right into the cone and because it is loosely wrapped the plant is still highly visible. Spiraled wire also offers embellishment opportunities for charms and other drops on the base. Wire knitting and chainmaille "vases" are also options for air plants. Weave together fine-gauge wire of your favorite color into a pouch shape. Create two loops on either side of the opening of the pouch for easily stringing onto a chain or cord. (One loop may not be enough to keep the vase from overturning during wear.) Connected jumprings also produce a pouch perfect for an air plant. For wire-wrapped, woven or chainmaille vases, be sure the air plant is fully dry after its twice weekly spritzing before putting the plant back into the "vase" for wearing.